Medical marijuana isn’t new in Canada – it has been legal in increasing doses since 2001. However, group insurance coverage for it is something that we are just seeing now. The door has been opened to including medical marijuana on group benefit insurance plans in Ontario by some very big names: Sun Life and Manulife. Both are two of the largest group benefit providers in Ontario, and other group insurance providers are likely to follow suit. Manulife’s medical marijuana coverage has been in-market since March 2017, most notably with its group benefits client Loblaw/Shoppers Drug Mart offering coverage for its 45,000 employees – but it is very limited to specific conditions. Sun Life will only support medical marijuana coverage for specific diseases and conditions which have been clinically proven to be helped by cannabis. These include nausea from cancer treatment, severe or refractory pain from cancer treatment, neuropathic pain and/or spasticity from multiple sclerosis, rheumatoid arthritis which has been unresponsive to other therapy, anorexia or neuropathic pain in HIV/AIDS patients, and palliative care. Manulife’s plan is similar – it will only cover specific conditions such as the symptoms of MS and to combat the side effects of chemotherapy for cancer patients. While the insurance companies promise constant review as clinical evidence arises for further conditions that cannabis can treat, this clinical evidence is unlikely to surface in the short-term as no one pharmaceutical company has a financial interest in cannabis. No company holdsmedical Marijuana or can hold, a patent on it as a drug. As time goes on, cannabis producers and industry organizations may fund needed clinical trials once cannabis becomes legal and they have the money to do so, but for now, we can expect the scope of Ontario group benefits coverage of medical marijuana to be limited. If you would like to offer medical marijuana coverage to your employees, but don’t want the limited coverage that the group benefit giants are currently providing, you could set up Health Care Spending Accounts (HSAs). Usually used as a bolt-on to a traditional group benefits plan, an HSA allows businesses to set up a specific amount of money for spending on additional health care expenses to a set dollar amount for each employee class. They can spend it on any kind of expense that can qualify as medical, and a prescription for medical marijuana would be enough, and it is all administered by the insurer. HSAs are great perks for employees, as they can pay for additional costs like dental work or vision care that the regular plan may not cover. HSAs traditionally cover all allowable medical expenses following CRA guidelines, which allow medical marijuana to be written off as a medical expense. HSAs also don’t contribute to the insurer’s calculation of whether or not your premiums go up each year, since your business sets aside the money for each employee, rather than relying on the insurer to pay out on a claim. In this way, they can be an excellent option for businesses with employees who are heavy users of traditional group benefit plans – partitioning all dental into an HSA, for example, could be a move that keeps your premiums from going up if everyone is getting braces for their kids once every couple of years. They also reduce tax liability for your employee over just handing them the money – at which point it becomes a taxable benefit for them. Your only cost for an HSA is the money you put into it and a small administration cost from the insurer. If your employees are using medical marijuana there will be increased liabilities to your business. For example, preventing an employee from using a prescribed medication while at work could result in the employee pursuing a human rights tribunal claim. The resulting legal fees and or expenses to defend a human rights claim are not included under standard Commercial General Liability policies. A separate Legal Expense policy including Employment Practices Wrongful Acts coverage may be required. You should ask your broker about additional liability coverage your business may need. With the advent of legal marijuana on the close horizon, ensuring that you are covered from a liability standpoint is a recommended risk control measure to avoid complications in the future. 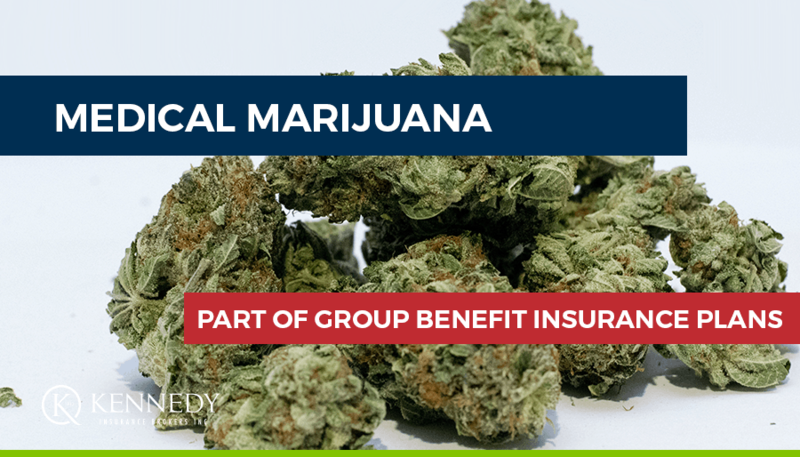 If you’d like to know more about medical marijuana insurance coverage in Ontario, contact Kennedy Insurance today and one of our helpful brokers will be happy to answer your questions.